This article was originally posted on the Archie Rose distillery website and written by master distiller Dave Whiters. In gin manufacturing, so many of the materials we use are dried or effected in ways that make them stable for transport and use year-round. The botanical is bred, cultivated and sold to a processing company, before it changes hands with any number of wholesalers, and is finally sold onto the distiller. It’s a long process. And in all honesty, it can make it hard for distillers to have a real understanding of the people and place behind the ingredients. Wherever possible, we work closely with the original producers or with wholesalers that source direct. And now, with the release of our Summer Gin Project spirits; Bush and Coast, we’re working even more with wild ingredients. It’s taught us a lot. It’s laborious and challenging, yes. But it’s also completely changed the way I think about sourcing. With Coast or Bush, you can’t help but taste the place it came from. Here’s the how and why of it. As modern consumers we’ve become accustomed to getting what we want when we want it: stone-fruit from China in the dead of winter, oranges from California in the height of summer. Dried ingredients like coriander seed, angelica and orris root can be distilled at any point in the year, anywhere on earth. It’s easy to be lulled into using ingredients that are stable, reliable and consistently the right shape or size. But working with wild ingredients for Bush and Coast forced us to completely re-evaluate the way we interact with our ingredients. We surrendered to the seasons and Mother Nature. And we didn’t look back. The quantities required to generate these gins meant that our forager, Diego Bonetto, needed to scout out a number of locations. For our pink peppercorn, it took three foragers eight hours to harvest what we required for one distillation run. And that doesn’t even include the four or so hours it took five of us to remove the peppercorns from the stems before we started distilling! It’s easy to think of foraging as being a leisurely pursuit, but the reality is that once you’ve scouted for the right location, the next obstacle is the elements. Our pink peppercorns were picked from trees with ladders. The farmer’s friend was done on bended knee with trowels. All easy enough. But the sea lettuce? It can only be harvested at low tide on rock escarpments. All of a sudden it wasn’t production deadlines that decided how things ran but the rain, wind patterns, rough seas and temperature. Foraging for wild ingredients comes with great responsibility not to upset the balance of the natural environment. This means in some cases, ingredients have to be harvested from multiple locations so that micro ecosystems are not dramatically impacted. The method of harvesting is also critical. 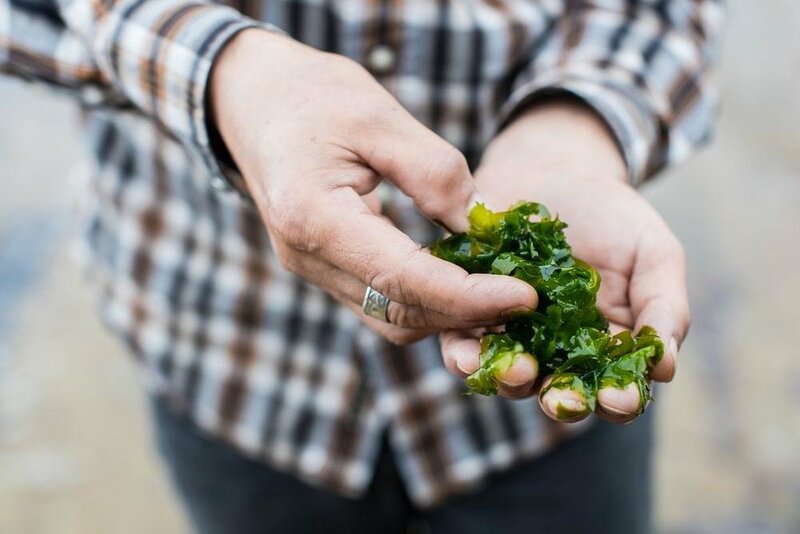 For example, for Coast, we cut the sea lettuce rather than picking it to help preserve the root system. This project forced us to think outside the box. When we ran a pilot distillation of farmer’s friend, we were dismissive at first. “But it’s a weed?,” many of us said. “It’s doesn’t exactly scream ‘high quality gin’.” Oh, how wrong we were! We distilled it anyway and were impressed with its distinctive herbal and earthy aroma. It ended up becoming one of the heroes of Bush. And right there was our reminder that experimentation can lead to incredible discoveries. Even a humble weed has beauty if you give it a chance and treat it with care. There’s sometimes pressure with commercial ingredients to only sell the best (and best looking) of a harvest. And when we started this process, I was of the opinion that to make great gin, we could only use ingredients that looked amazing. I stand corrected. When we received the first drop of pink peppercorns required to carry out a distillation run, we also received a small amount of peppercorn buds. These buds were green, tiny, unripe and needed to be separated out from the larger peppercorns. But rather than discarding them, we ran the buds through our five litres pilot still to see what type of distillate it would yield. We were blown away by the verdant, vibrant and floral result – we had to use it in the final gin. If we’d been more single-minded about what quality produce is, we’d never have discovered this fantastic flavour. In conclusion? There’s so many surprises out there, and we have so much more to learn. Dave Withers master distiller of Archie Rose talks about the Summer Gin Project with professional forager Diego Bonetto.